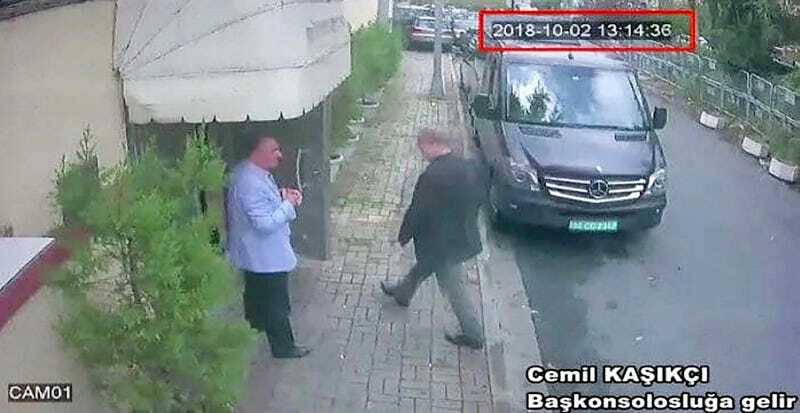 This image taken from CCTV video obtained by the Turkish newspaper Hurriyet and made available on Tuesday, Oct. 9, 2018 claims to show Saudi journalist Jamal Khashoggi entering the Saudi consulate in Istanbul, Tuesday, Oct. 2, 2018. Uber CEO Dara Khosrowshahi has said that he’ll pull out of a conference in Saudi Arabia called the Future Investment Initiative. The conference, known informally as Davos in the Desert, has become a focal point for people upset about the October 2 disappearance of Washington Post journalist Jamal Khashoggi, believed to have been murdered in the Saudi consulate in Turkey at the behest of the Saudi government. Saudi Arabia has been incredibly important to many in the tech community, including Uber. As CNBC points out, the Saudi Arabian Public Investment Fund invested roughly $3.5 billion in Uber just two years ago. According to the Washington Post, American intelligence officials have evidence that Saudi Arabia “ordered an operation” to detain Khashoggi. Turkish officials, however, reportedly believe Khashoggi was murdered inside the Saudi consulate and his body was broken into pieces with a bone saw. Khashoggi’s body was then allegedly smuggled out of the consulate in bags and sent on a private flight back to Saudi Arabia. Khashoggi, a Saudi national with permanent residency in the United States, had been a prominent voice of reform in the Saudi kingdom, despite so-called liberalization under Crown Prince Mohammed bin Salman that allowed women to drive and movies to be screened publicly. But Uber isn’t the only one pulling out of planned appearances in Saudi Arabia following international outcry over Khashoggi’s allegedly brutal murder. As Recode notes, former AOL CEO Steve Case has cancelled plans to attend the Future Investment Initiative conference. And Richard Branson recently suspended investment talks between his company Virgin Galactic and the Saudi government. Meanwhile, the Trump regime has made excuses for the Saudis left and right. U.S. Treasury Secretary Steve Mnuchin told CNBC this morning that despite Khashoggi’s murder, he still plans to visit Saudi Arabia for the Future Investment Initiative. “I am planning on going at this point. If more information comes out and changes we can look at that,” Mnuchin said, without mentioning that western intelligence agencies already have a lot of damning information. And yesterday, in an Oval Office press conference, President Trump explained that while he was sympathetic to the death of a journalist, the journalist wasn’t an American citizen. The insinuation was that Khashoggi’s death mattered less for this reason, and Trump’s weakness may be making Saudi Arabia more emboldened to commit human rights abuses. “I would not be in favor of stopping a country from spending $110 billion—which is an all-time record—and letting Russia have that money and letting China have that money,” President Trump said, in reference to America’s arms deal with Saudi Arabia. To make matters even more complicated, the American public has no idea precisely how much money President Trump is making personally from his relationship with Saudi Arabia. All we know for sure is that it’s a lot of money, especially as Saudi officials stay at Trump hotels when they come to New York and Washington, D.C.
Nobody has ever accused President Trump of putting principles over money. But in this case, it’s not clear that Trump’s principles are aligned with liberal democracy and the things that Jamal Khashoggi stood for. Trump continues to coddle dictators. And Saudi Arabia is no different.